Instructors at hundreds of colleges and universities have turned to How to Write Anything for support that empowers every student with advice they need, when they need it. 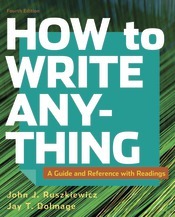 And students love it—holding onto the book for other classes —because the authors’ tone makes writing in any genre approachable, with a flexible, rhetorical framework for the most commonly taught academic and public genres. The fourth edition offers students a new Part 1: Strategies for College Writing, even more support for understanding genres and purpose, and an expanded and thoroughly revised take on grammar, mechanics, and usage—all essential to academic success. The result is everything you need to teach composition in a flexible and highly visual guide, reference, handbook, and reader. Also available: LaunchPad, an online course space with pre-built units featuring the full e-book, book-specific reading comprehension quizzes, adaptive LearningCurve activities to help students hone their understanding of reading and writing, and additional support in A Student’s Companion to How to Write Anything.